He is great!! Friendly, Knowledgeable, thorough, passionate about making people well. I found my lifelong doctor. I don’tneed to go anywhere else. He is great!! Friendly, Knowledgeable, thorough, passionate about making people well. I found my lifelong doctor. I don’t need to go anywhere else. It was good, the lady who was running the appointment (mimi) was really professional, Dr. AZmi was nice and took timeto listen to my problems and respond them one by one. It was good, the lady who was running the appointment (mimi) was really professional, Dr. AZmi was nice and took time to listen to my problems and respond them one byone. 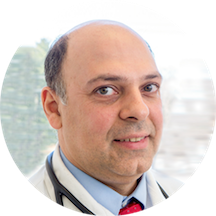 Hooman Azmi is a friendly and accomplished internist based in Rockville, MD. Dr. Azmi attended the Kermanshah University School of Medicine in Iran, where he earned his medical degree. He completed his residency program in internal medicine at the Brookdale University Hospital and Medical Center in Brooklyn, NY. Dr. Azmi is certified by the American Board of Internal Medicine and a member of the American College of Physicians. His medical career is marked by many outstanding contributions to the field of internal medicine. He has conducted and participated in many research projects, given presentations and talks at numerous medical functions, and been published several times. Dr. Azmi is uncompromising in his dedication to the wellbeing of his patients. Patients see him for a variety of reasons, including urology problems, varicose veins, dyspareunia, sickle cell disease, vertigo, thalassemia, pyelonephritis, and emphysema. Dr. Azmi speaks English and Farsi fluently. Dr. Hooman Azmi is now a certified in suboxon prescription and buprenorphine as it pertains to addiction treatment. I highly recommend Dr. Azmi. He listened and gave me his complete attention. First time patient at Dr. Hooman’s office, the nurses & ladies at the front desk were welcoming from the moment I walked in. Dr was awesome, funny as well! Bedside manners were great . He was attentive and asked a lot of questions. My appointment was scheduled for 8:30 on purpose so I would get to work on time. 10 minutes before the appointment, I received a call that the doctor was running late and he wouldn't be in the office until 9-9:15. Theysaid they were telling all the patients to come in around this time ... meaning everyone would be running late and I probably might not see the doctor until 9:30-9:45! I’m 26 years old and haven’t seen a doctor in almost 10 years. The idea of going to a health facility makes me extremely anxious and freaks me out. Before I would avoid going at all cost. Dr Azmi is verywarming, kind and just a genuine person. His demeanor is really calming and if you’re like me who refuses to see a doctor make an appointment with this man. He’s a good dude. He does try to be as productive as possible and sometimes doctors just brush people off but he actually can be productive but at the same time make you feel like your health is as important to him as he is to you. I will be coming back. The doctor is great and knows his job well. I did not like that the waiting time was too much before anyone attends you. Dr. Azmi rushes every time. It irks me because it’s unprofessional and shows as he doesn’t care. Doesn’t take time to really explain what’s going on. You have to come prepared with questions to get answers from him. I certainly thinkhe is unprofessional because he doesn’t give you his dedicated time to listen to your problems or a chance to ask questions. Went smoothly. Thoroughly but at ease. Amazing! Great staff and great Doctor. Highly recommended! ?? People at reception (3 people) did not behave professionally. They asked me to sign in the visit list where I marked that I am a current patient. The doctor told me that they registered me as a new patient. What wasthe reason to fill out that paper then? My appointment was scheduled for 9 am, one more patient was scheduled at the same time. Both, I and he, were waiting for more than an hour. The doctor came after 9 am, about 9:10. I was called to the doctor at 10:08 and was waiting for another 15 minutes there. When I asked the nurse why do I need to wait for so long I was told that the doctor has another appointment at 8:30 (google shows the office is opening at 9 am and the doctor came at 9:10). The procedure took 10 minutes but I spent almost 2 hours in the office. Unbelievable. Disappointed. Very kind and helpful. It is a very friendly and clean office. Thanks! I really like my visits to Dr Azmi’s Office. He is always knowledgeable and caring and his staff are always ready to help. You can’t find a more reliable doctor who acts in your best interest than Dr Azmi. The waitis usually short, the place is clean and he always explains what’s going on and most caring professional. If you ever get really sick and you need someone that cares enough to diagnose you accurately and that’s Dr Azmi. If you need same day appointment his staff usually gets you in so you can get checked. I have been very happy with his office and their standards of care and highly recommend you to pick him over any other Dr in the area. my concerns about my migraine headaches and thyroid condition were dismissed. Dr. Azmi laughed at me when I spoke about my concerns. I left very upset and disgusted. I spoke to him about my miscarriages and he told me to eatless cheese and that I didn't need fertility meds that I am on!!!! totally out of line and absurd. Super sexist and said things that doctors are 100% not supposed to say. Unless you're an older conservative Muslim - and i mean conservative, I would not come here. Very nice doctor, but I do not know if he is for me. Had a 9:30am appointment wasn't seen till close to 11am. The doctor is very nice but seem to be in a rush the whole time. At one pointhe was walking backwards out the the room while still talking to me. I do not have a primary care doctor but I will have to find another one. Dealing with a chronic medical condition, I’ve been to a lot of doctors. But none match the quality, attentiveness, and passion of Dr. Azmi. I feel truly blessed to have my first appointment with him, and having him as my new primary care doctor. Was seen very quickly by a physician's assistant to take blood pressure and weight. Dr. Azmi saw me shortly thereafter for a quick checkup and, as always, was very friendly and interested in hearing what has been going on in mylife, how I've been feeling, etc. I was able to quickly get my blood drawn, give a urine sample, and get a flu shot, too. I was in and out in about 30 minutes, which is great. The only thing negative that I would say is that the office's upkeep needs a bit of attention, as things look a little shabby. This obviously does not have much to do with the appointment, though some updating would help improve guests' comfort and overall impression of the office. Dr. Azmi and his staff are very great to work with. Scheduling is easy, and I rarely have a long wait time. There have been a few times where it seems as though Dr. Azmi is rushed and tends to rush me through my explanations of symptoms and issues. Doctor Azmi and the staff are very nice and professionals. Very knowledgeable! Is careful with each patient. Dr. Azmi has excellent bedside manner and he really seems like he cares. The other staff were also very nice. The wait till was a little high but that may have just been the particular day I went. Dr Azmi is an amazing doctor. I highly recommend him to anyone. Such a nice, genuine, and warm man. Very professional and informed. Felt totally comfortable with him and his staff. Dr. Azmi is very professional, great at simplifying things,and a pleasure to talk to. Extremely knowledgeable, and spent enough time discussing about my health concerns. The staff were very friendly, polite and helpful. Dr. Azmi is THE best doctor ever. EVERYTHING about his care is amazng! Once seen, the Doctor IMMEDIATELY can sense what is the slightest ailment that is being experienced. Dr. Azmi is VERY compassionate, and feel very lucky that he ismy Primary Care Doctor. He has recmmended me to a specialist, who is amazing as well. Dr. Azmi is THE man!